Not to be confused with Cestohowa, Texas. Częstochowa, [t͡ʂɛ̃stɔˈxɔva] ( listen), is a city in southern Poland on the Warta River with 224,376 inhabitants, making it the thirteenth-largest city in Poland. It is situated in the Silesian Voivodeship (administrative division) since 1999, and was previously the capital of the Częstochowa Voivodeship (1975–1998). 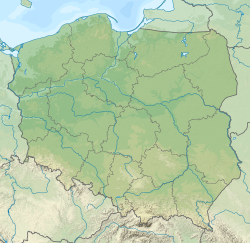 However, Częstochowa is historically part of Lesser Poland, not of Silesia, and before 1795 (see: Partitions of Poland), it belonged to the Kraków Voivodeship. Częstochowa is located in the Kraków-Częstochowa Upland. It is the 13th most populous city in Poland. It is the largest economic, cultural and administrative hub in the northern part of the Silesian Voivodeship. The city is known for the famous Pauline monastery of Jasna Góra, which is the home of the Black Madonna painting (Polish: Jasnogórski Cudowny obraz Najświętszej Maryi Panny Niepokalanie Poczętej), a shrine to the Virgin Mary. Every year, millions of pilgrims from all over the world come to Częstochowa to see it. The city also was home to the Frankism movement in the late 18th and the 19th century. There is also a Lusatian culture excavation site and museum in the city, and ruins of a medieval castle in Olsztyn, approximately 25 kilometres (16 miles) from the city centre (see also Trail of the Eagles' Nests). Kazimierz Pulaski and the Bar Confederation 1772 defence of Częstochowa. Painting by Chełmoński. In the Polish Defensive War of 1939, Częstochowa was defended by the 7th Infantry Division, part of northern wing of Kraków Army. After the Battle of Mokra and other battles, Polish forces withdrew, and the Wehrmacht entered the city on Sunday, September 3, 1939. Częstochowa was renamed into Tschenstochau, and incorporated into the General Government. Monday, September 4, 1939, became known as Bloody Monday or also Częstochowa massacre, when 227 people (205 ethnic Poles and 22 Jews) were killed by the Germans (some estimates of victims put the number at more than 1,000; 990 ethnic Poles and 110 Jews). German occupiers from the very beginning initiated a plan of cultural and physical extermination of the Polish nation. Częstochowa was a city county (Stadkreis Tschenstochau), part of the Radom District of the General Government. The city was located near the border with Upper Silesia Province, and in its area operated units of the Home Army and National Armed Forces (NSZ). On April 20, 1943, a NZS unit attacked the local office of the Bank Emisyjny w Polsce. After the collapse of the Warsaw Uprising, Częstochowa briefly was the capital of the Polish Underground State. In the autumn 1944, Germans fortified the city, preparing for a lengthy defence. On January 16, 1945, however, the Wehrmacht retreated after just one day of fighting. It can be said that the climate is humid continental (Köppen: Dfb), but still with some oceanic characteristics (Cfb), especially in recent normals. Częstochowa is in one of the hottest summer regions in Poland, although its inventions are not the most rigorous, they are colder than the more moderate climates of the west and the Baltic Sea. On average, four hours a day with direct solar radiation. In the course of the year, the best insolation is observed in June, due to the greatest length of the day. There are few windless days in Częstochowa. Lull periods on an annual scale account for an average of 9.2%. Western winds prevail here - 18% and south-west - 18.2%. At the same time, they achieve the highest speeds from these directions - 2.2 m/s. The northern winds are least common - 7.7% and north-eastern winds - 7.4%. The ISD Częstochowa Steelworks - one of the biggest steelworks in Poland, initially established in 1896. The Steelworks produces over 65% of steel sheets manufactured in Poland and has an approximate 35% share in the entire national consumption of this product. Trade and commerce In Częstochowa, there is the Jurajska Shopping Mall, which was opened in 2009. It has 200 shops, service and catering outlets and a Cinema City multiplex. It provides clients with a multi-storey car park with 2000 parking spaces. Additionally, there are hypermarkets - M1 Shopping Centre and Auchan Northern Częstochowa (previously Real, opened in 1997), Tesco (opened in 1999) and Auchan Częstochowa Poczesna (opened in 2001). Former Orthodox Vicarage - classicist townhouse, built in 1875, until 1918 it was the seat of a local Orthodox priest. In 1918, it was taken over by the local Catholic diocese. After the war, there was a local headquarters of Polish Army. Since the 1970s it has been a property of the Częstochowa Regional Museum. Old Square - a square located in the Old Town district with dimensions of 100m by 66m. Since medieval times it operated as the main square of Old Częstochowa. There are still preserved old townhouses, which are listed on the historic monuments register. Between the 15th century and 1812, a town hall was located there, which was then damaged because of a fire. In 2007, archaeological works began. As a result, a city well was found and also fundaments of city facilities such as a weigh house and gallows. Wieluńska Street - one of the historic streets in Częstochowa, located in the vicinity of Jasna Góra monastery. It is 300 meters long and the buildings on the street were erected in the late-classicist style in the second half of the 19th century. Cathedral Basilica of the Holy Family, Częstochowa - a cathedral built in the neo-gothic style between 1901-1927. In 1925, it became a cathedral of a Roman Catholic Diocese of Częstochowa and in 1992 it became the basilica of the Roman Catholic Archdiocese of Częstochowa. St James' Church - built between 1869 and 1872 under the initiative of a Tsar's representative for Częstochowa region - Parmen Kashernikov. Initially, it was a seat of an Orthodox parish of Saints Cyril and Methodius. In 1914, it became a property of a Catholic church, serving as an army parish church. After the end of First World War, it was retained by the Catholic church as part of the Recovery of Orthodox Churches in the Second Polish Republic. In 1937, the Archdiocese of Częstochowa established a parish of St James. St Sigismund's Church - a gothic church built in the 15th century, making it the oldest parish church in Częstochowa. St Barbara's Church - built in the 16th century under the initiative of Father Andrzej Gołdonowski from the Pauline Order. The place is linked to the icon of the Black Madonna of Częstochowa. Following the desecration of the icon by robbers in 1430 who left it at a spring next to the current location of church. The public transport is managed by the Częstochowa City Council of Roads and Transport. The public transport carriage is contracted to the City Public Transport Corporation (Miejskie Przedsiębiorstwo Komunikacyjne). The public transport in Częstochowa comprises 3 tram lines, 30 city bus lines and 8 suburban lines connecting Częstochowa with Blachownia, Mstów, Konopiska, Poczesna, Olsztyn. The bus transport connecting Częstochowa Bus Station with other towns and villages in the Częstochowa region is operated by the Częstochowa Bus Transport Ltd. (PKS Częstochowa). The closest airport is the Katowice International Airport, which is located 60 km (37 mi) from Częstochowa, and a small Częstochowa - Rudniki airport in Kościelec, Rędziny. Gallery of 19th and 20th Century Sculpture and Painting, located on Katedralna Street inside a two-storey terrace house from the beginning of the 20th century. There are three exhibitions: Art of Young Poland, Polish Avant-garde and Modern Art, Częstochowa's Art of the 19th century and first half of the 20th century. Archaeological Reserve of Lusatian Culture, located in the Raków neighborhood on Łukasińskiego Street. This 2500-year-old burial ground was discovered in 1955 during construction works of Częstochowa's tram line. It is a permanently maintained burial ground from the early stages of the Iron Age (750–550 years BC). Tourists have been able to visit the site since 1965. Around the burial ground, there are showcases about the Lusatian culture. Museum of Iron Ore Mining, established in 1976 in underground corridors resembling mine corridors. The Museum recreates mine workings and is equipped with mining equipment from the closed down mine "Szczekaczka". City Gallery of Art, established in 1977. Promotes and presents modern art. Zdzisław Beksiński The museum forms part of the City Gallery of Art. It also organises cyclical cultural events such as IV Triennale of Art 'Sacrum', Jurajska Autumn, City Setting. Museum of Match Production (pl), located inside the building of a former match factory on Ogrodowa Street. The visitors can see the historic machine park from the late 19th century and retrace the match-making process - from barking through making 'sticks' to packing the matches. In the museum, there are also documents relating to the match-making industry and an exhibition called 'Sculptures from a single match'. In another hall, one can see a phillumenistic exhibition, where matchbox labels from various periods are displayed. International Festival of Sacral Music 'Gaude Mater'. It has been organised since 1991 and it takes place each year in the beginning of May. It is organised under the auspices of The Ministry of Culture and National Heritage and the Polish Episcopal Conference. The main aim of the festival is to bring various cultures closer through presenting music typical of different religions. It also seeks to present contemporary Polish music and to promote young composers through "Musica Sacra" - The International Competition for Young Composers. The Gaude Mater festival also addresses problematic aspects of sacrum in music during various seminars organised during the Festival. In Częstochowa, there are three cinemas. Two are part of chain of cinemas Cinema City Poland: Cinema City "Wolność" (Freedom), which has 1766 seats, and Cinema City Galeria Jurajska, opened in 2009. There is also an independent cinema, Ośrodek Kultury Filmowej (Centre of Cinematography), established in 1991. CKM Włókniarz Częstochowa – speedway team from Częstochowa, established in 1946 3rd place in season 2005, 2nd place in season 2006 first place in season 2003, 3rd place in 2009. Włókniarz finished last season in 1 Liga (2nd Tier) on 3rd place and obtained promotion to Speedway Ekstraliga. AZS Częstochowa – men's volleyball team playing in Krispol 1. Liga Siatkarzy (Polish 2nd Division), 6 times Polish champion, 6 times 2nd place in Polish championship, 4 times 3rd place in Polish championship, twice Polish Cup winner, winner of the CEV Challenge Cup 2011/2012, 16th place and relegation from PlusLiga in season 2016/2017. The club was established in 1945. KS Norwid Częstochowa – men's volleyball team playing in Krispol 1. Liga Siatkarzy (2nd level in the Polish volleyball league system). The club was established in 2002. KS AJD Częstochowianka Częstochowa - women's volleyball team playing in PZPS Druga Liga Kobiet (3rd level in the Polish volleyball league system). Raków Częstochowa – Częstochowa's greatest football team, plays in the I liga (Poland) (2nd level of the Polish football league system). Runners-up of the Polish cup in 1966–67. As youngsters, both Jerzy Brzęczek and Jakub Błaszczykowski played for Raków, as well as Jacek Krzynówek. The club was established in 1921. They finished season 2016/2017 in II liga (3rd level in the Polish football league system) on 1st place and obtained promotion to I liga (Poland) . Skra Częstochowa – Częstochowa's second best football team, plays in the III Liga Opole-Silesia Division (4th level of the Polish football league system). The club was established in 1926. They finished season 2015/2016 on 7th place. Orzeł Kiedrzyn - team playing in Liga Okręgowa - Częstochowa Regional Division (6th level of the Polish football league system). The club was established in 1950. UKS Ajaks Częstochowa - team playing in Klasa B - Częstochowa Regional Division (8th level of the Polish football league system). The club was established in 1998. In the Częstochowa 2018 mayoral elections the results were as follows: Krzysztof Matyjaszczyk (Democratic Left Alliance) 59.76%, Artur Warzocha (Law and Justice) 25.54%, Marcin Maranda (Residents of Częstochowa) 6.17%, Tomasz Jaskóła (Kukiz'15) 5.27%, Jacek Krawczyk (Civic Coalition) 2.83%, Martin Saczek (Razem) 0.43%. In the Częstochowa City Council Elections 2018 the results were as follows. Seats in the city council: Left Democratic Alliance (32.80%) 12, Law and Justice (26.04%) 10, Civic Coalition (15.98%) 5, Together for Częstochowa (Independents) (8.77%) 1. After elections in Częstochowa was formed a centre-left coalition between liberal and pro-market Civic Coalition and social democratic Left Democratic Alliance. Conservative Law and Justice remained in oppossition. Samuel Willenberg , another Treblinka survivor who participated in the uprising. ^ a b c d e f g h "Częstochowa Official Website". Urząd Miasta Częstochowy, ul. Śląska 11/13, 42-217 Częstochowa. Retrieved September 15, 2014. ^ Franciszek Kulczycki, "Monumenta mediiaevi historica res gestas Poloniae illustrantia", Tomus IX, Cracoviae, 1886, p. 27. ^ Ellan.pl. "Viola - pizzeria Częstochowa, pizza na telefon z dowozem - pub - imprezy". www.pizzeriaviola.pl. Retrieved 15 March 2018. ^ "Czestochowa, Poland (Pages 39-47)". www.jewishgen.org. Retrieved 15 March 2018. ^ "Holocaust Survivors: Encyclopedia - "Czestochowa Ghetto"". www.holocaustsurvivors.org. Retrieved 15 March 2018. ^ a b Duricy, Michael P. "Black Madonnas: Our Lady of Częstochowa". © 2008 The Marian Library/International Marian Research Institute, Dayton, Ohio. Archived from the original on 2011-10-12. Retrieved 2008-10-22. ^ "Klimat: Częstochowa: Klimatogram, wykres temperatury, tabela klimatu - Climate-Data.org". pl.climate-data.org. Retrieved 2019-01-04. ^ Update of the Environmental Protection Program for the city of Częstochowa (Poland). City Hall of Czestochowa. [access 2011-04-06]. archived from this address (2012-02-05). ^ "Częstochowa (12550) - WMO Weather Station". NOAA. Retrieved January 4, 2019. Archived January 4, 2019, at the Wayback Machine. ^ "Regionalna Izba Przemysłowo-Handlowa w Częstochowie". www.riph.czest.pl. Retrieved 15 March 2018. ^ "Home". isd-poland.com. Retrieved 15 March 2018. ^ "We've moved!". www.trw.com. Retrieved 15 March 2018. ^ "Cooper Standard". Cooper Standard. Retrieved 15 March 2018. ^ "Home page". Brembo – Official WebSite. Retrieved 15 March 2018. ^ "Wystąpił błąd..." www.koksownianowa.pl. Archived from the original on 2017-06-22. Retrieved 15 March 2018. ^ http://www.strony.com.pl/, Kaczka Studio -. "Guardian Częstochowa". guardian-czestochowa.com. Retrieved 15 March 2018. ^ "Galeria Jurajska Częstochowa - sklepy, kino, restauracje". www.galeriajurajska.pl. Retrieved 15 March 2018. ^ "Wyborcza.pl". czestochowa.gazeta.pl. Retrieved 15 March 2018. ^ "MPK in Częstochowie Sp. z o. o. - Home". www.mpk.czest.pl. Retrieved 15 March 2018. ^ "Muzeum Częstochowskie". Muzeumczestochowa.pl. Retrieved 2014-07-31. ^ "Dom Poezji - Muzeum Haliny Poświatowskiej". Poswiatowska.muzeumczestochowa.pl. Retrieved 2014-07-31. ^ "Rezerwat ArcheologicznyDotknij przeszłości…Zapraszamy nauczycieli wraz z uczniami na warsztaty! - Muzeum Częstochowskie". www.muzeumczestochowa.pl. Retrieved 15 March 2018. ^ "Muzeum Górnictwa Rud Żelaza - Muzeum Górnictwa Rud Żelaza – Muzeum Częstochowskie". kopalnia.muzeumczestochowa.pl. Retrieved 15 March 2018. ^ www.trustnet.pl. "Miejska Galeria Sztuki w Częstochowie". www.galeria.czest.pl. Retrieved 15 March 2018. ^ imoli.pl. "Częstochowskie Muzeum Zapałek". www.zapalki.pl. Retrieved 15 March 2018. ^ "Tomek Sętowski - Fabryka Snów - Muzeum". Setowski.art.pl. Archived from the original on 2014-08-16. Retrieved 2014-07-31. ^ "Museum of Coins and Medals Commemorating John Paul II". Jp2muzeum.pl. Retrieved 2014-07-31. ^ "Konduktorownia". Konduktorownia.eu. Retrieved 2014-07-31. ^ "Collegium Cantorum Excellence comes from experience". Collegiumcantorum.com. Archived from the original on 2014-08-08. Retrieved 2014-07-31. ^ 2013, Kaczka Studio, www.kaczka.com ®. "Bronislaw Huberman Czestochowa Philharmonic Hall". www.filharmonia.com.pl. Retrieved 15 March 2018. ^ Redhand.pl - Strony Internetowe Częstochowa. "Teatr im. Adama Mickiewicza w Częstochowie". Teatr-mickiewicza.pl. Retrieved 2014-07-31. ^ "Festiwal Muzyki Sakralnej Gaude Mater 2014 :: Glowna :: Międzynarodowy Festiwal Muzyki Sakralnej w Częstochowie" (in Polish). Gaudemater.com. Retrieved 2014-07-31. ^ "Gaudemater" (in Polish). Gaudemater.pl. Archived from the original on 2014-07-26. Retrieved 2014-07-31. ^ Szymon Mrożek (2011-03-22). "X Międzynarodowy Festiwal Jazzu Tradycyjnego Hot Jazz Spring". Hotjazzspring.eu. Retrieved 2014-07-31. ^ "Częstochowski Festiwal Kultury Alternatywnej FRYTKA OFF ::: 21-22 czerwca 2013". Frytkaoff.czestochowa.pl. 2013-01-24. Retrieved 2014-07-31. ^ "ReggaeOn - Częstochowa". Reggaeon.czestochowa.pl. 2013-01-24. Archived from the original on 2015-04-04. Retrieved 2014-07-31. ^ "HIP HOP Elements Częstochowa". pl-pl.facebook.com. Retrieved 15 March 2018. ^ Bielecka, Katarzyna (2013-01-24). "Aleje - tu się dzieje". Aleje.czestochowa.pl. Retrieved 2014-07-31. ^ "Premiery filmowe - Zapowiedzi - Filmy 3D - Cinema City - Strona główna". www.cinema-city.pl. Retrieved 15 March 2018. ^ "Ośrodek Kultury Filmowej w Częstochowie". Okf.czest.pl. Retrieved 2014-07-31. ^ "Politechnika Częstochowska - 67 lat doświadczenia w działalności naukowej i edukacyjnej". www.pcz.pl. Retrieved 15 March 2018. ^ "Akademia Polonijna - Polonia University - studia ekonomia, pielęgniarstwo licencjat pielęgniarstwo magister, studia pomostowe praca socjalna filologia angielska prawo w biznesie studia podyplomowe, kryminalistyka, ekspertyza dokumentów, przygotowanie pedagogiczne". www.ap.edu.pl. Retrieved 15 March 2018. ^ "School of Graduate Studies in Hospitality Management and Tourism in Częstochowa". Wshit.edu.pl. Retrieved 2013-12-23. ^ "Studiuj Online - Wyższa Szkoła Lingwistyczna w Częstochowie". www.wsl.edu.pl. Retrieved 15 March 2018. ^ "Dla kandydatów" (in Polish). Wsz.edu.pl. Retrieved 2013-12-23. ^ "CJE-NKJO Częstochowa - News" (in Polish). Cjenkjo.edu.pl. Archived from the original on 2013-12-13. Retrieved 2013-12-23. ^ "Wyższe Seminarium Duchowne Archidiecezji Częstochowskiej" (in Polish). Seminarium.czest.pl. Retrieved 2013-12-23. ^ imoli.pl. "Strona główna - Centralna Szkoła Państwowej Straży Pożarnej w Częstochowie" (in Polish). Cspsp.pl. Retrieved 2013-12-23. ^ Włókniarz Częstochowa (2013). Najlepsze biegi sezonu [The best games of the season] (Sports TV broadcast). Częstochowa: Speedway Włókniarz Częstochowa. ^ Plus, Internet. "Miejski Ośrodek Sportu i Rekreacji w Częstochowie". www.mosir.pl. Retrieved 15 March 2018. ^ "Wybory samorządowe 2018". wybory2018.pkw.gov.pl. Retrieved 2018-12-27. ^ "Wyborcza.pl". czestochowa.wyborcza.pl. Retrieved 2018-12-27. ^ "Częstochowa: Wybory Samorządowe 2018 | Wyniki, kandydaci, okręgi, sondaże". www.portalsamorzadowy.pl (in Polish). Retrieved 2018-12-27. ^ "Kuria Metropolitalna w Częstochowie | Parafie alfabetycznie" (in Polish). Kuriaczestochowa.pl. Archived from the original on 2013-12-16. Retrieved 2013-12-23. ^ a b c d e "Association of Towns awarded The Europe Prize". www.czestochowa.um.gov.pl. Retrieved 2009-10-10. ^ "Twinning with Palestine". © 1998-2008 The Britain - Palestine Twinning Network. Archived from the original on 2012-06-28. Retrieved 2008-11-29. ^ "Hershl Sperling testimony on the Treblinka Death Camp". Holocaust Research Project. Archived from the original on 2012-12-20. Duricy, Michael P. "Black Madonnas: Our Lady of Częstochowa". University of Dayton. Archived from the original on 2011-10-12. Retrieved 2018-03-18. "Sanktuarium Matki Bożej Częstochowskiej na Jasnej Górze" (in Polish). Jasna Góra. Retrieved 2018-03-18. "Częstochowa Official Website". City of Czestochowa. Retrieved 2018-03-18. Wikimedia Commons has media related to Częstochowa. Wikisource has the text of the 1905 New International Encyclopedia article Czenstochowa. "Czenstochau" . Collier's New Encyclopedia. 1921.